Our friend and carpet expert, Mark Violand, of Violand Flooring Inspections, Inc. recently shared some timely advice about troublesome salt stains, and we couldn’t help but share it with you! Salt, salt and more salt. Salt on sidewalks, salt on floors, salt on entrance matting, and salt on carpet. Although this winter in Northeast Ohio has been relatively mild, any amount of snow that landed on walkways needed salt to prevent slippery accidents. The season is not over regardless of what Punxsutawney Phil or Buckeye Chuck said. Anyone who has lived in Northeast Ohio for any period of time knows that we are famous for 4 months of winter and 8 months of bad sledding. Walkways need salt to keep them safe, unfortunately a lot of that salt gets tracked into commercial buildings. I think Phil and Chuck should stick to being groundhogs and leave weather forecasting to professionals. The biggest frustration for anyone who has the responsibility for maintaining buildings is how to properly clean the carpet and floors once salt gets inside. 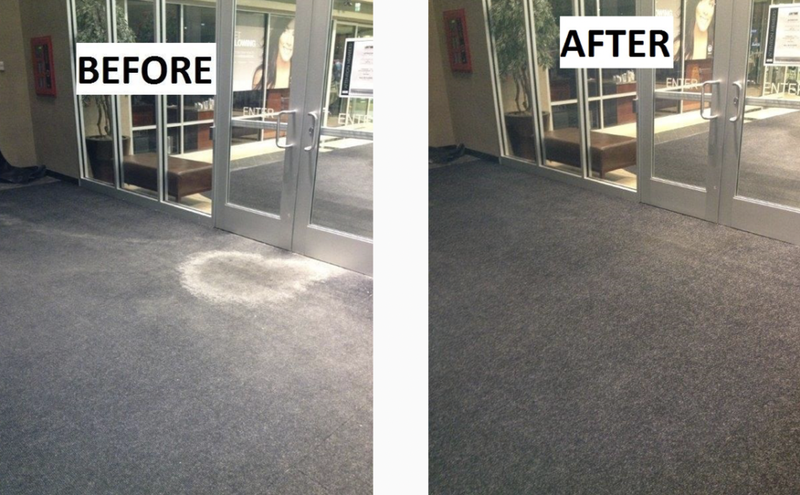 Removing salt residue from entrance mats and carpet is among the biggest challenges you will face this time of year. Why is salt more difficult to remove than plain soil? Particle size is the main reason but the biggest most frustrating factor is that salt dissolves when it gets wet. Salt like soil or sand, when dry can be swept up and vacuumed off carpet. Dirt and sand does not dissolve; salt will. The particle size of beach sand for instance can measure up to 2000 microns whereas salt is 70-100 microns in size. So what happens when the salt becomes a hardened, stalagmite-like encrustation on entrance mats? What can be done to remove it? Have you considered replacement? I remember back in the day, I would use a hammer to break up these encrustations. Although replacement may not be an option, sometimes its condition may be beyond a cost effective remedy. In some cases it takes repeated treatments to restore them to an acceptable appearance. And when I say repeated treatments, I mean repeated treatments. I remember in some buildings I used to maintain it was the end of June before the last vestiges of salt was finally removed. The best things I have found to remove salt from mats and carpet are carpet cleaning acid rinsing agents, even better are specially formulated Encapsulating Salt Stain Removers (emphasis on the later). During this time of year all you are able to do is keep the build up from getting worse, you cannot remove it all in just one treatment. Using a garden-type pump-up sprayer and depending on severity, spray either a light to heavy application ofEncapsulating Salt Stain Remover to the mats. Work it in using a rotary machine outfitted with a shampoo brush or better yet a machine with counter rotating brushes (CRB). The next step is to use a hot water extraction machine and use it like a wet vacuum to remove as much moisture as possible. Then proceed to clean them using a detergent specially formulated for low moisture carpet cleaning by spraying this onto the mats. Work it in with the shampoo brush or CRB machine. I have found that you get better results using bonnets as the removal step because you are not adding gallons of water which will dissolve the salt that will flow out and penetrate deeper into the mat when using hot water extraction cleaning. Salt and ice melt compounds have a tendency to wick back and the mats and carpet can look worse when dry. The bonnet will absorb the soil and much of the moisture that causes wick back. A bonnet is a thick, absorbent pad used in place of scrubbing brushes that are used on low speed rotary floor machines. Some bonnets have large loops and look like a string mop sewn into the shape of a circular pad. Some are thinner and have abrasivestrips sewn into them. I have used both but I prefer the thin bonnet better. There are some applications where the loopy bonnet works better. They come in different sizes to fit any machine and different fiber contents from cotton or blends of fibers like rayon and polyfibers. Bonnets are super absorbent and designed to remove a lot of moisture and soil from carpet. Simply run the dry bonnet over heavy duty installed matting, not rental type mats, they cannot take the spinning motion. Operate the machine back and forth as if you were scrubbing a floor. When the bonnet turns a dirty, dark gray color, flip it over. Don’t wait until it turns black, all you are doing then is spreading the dirt around. When both sides become soiled, it’s time to lay down a new bonnet. When you are finished, the bonnets need to be laundered so they can be used again. So it stands to reason, if this is a procedure you want to use, you will need to have a stack of bonnets available for use. What if I don’t have a CRB machine? A. Use a stiff broom or brush to work it in. What if I don’t have a hot water extraction machine? A. Use a shop vac for wet pick up. Q. What if I don’t have bonnets? A. Vacuum, vacuum, vacuum using the shop vac. You will probably end up with more wick back of salt, but in most cases the Encapsulating Salt Stain Remover will make removal by your subsequent dry vacuuming more productive. Now here is another hint – spray apply Encapsulating Salt Stain Remover on your mats each time it snows. As always the water from the snow and salt stain remover will evaporate and a white salt stain will appear on the mats. But now, it will be easier to vacuum up the salt residue than it would have been without it. -Mark Violand, Violand Flooring Inspections, Inc.